Instead of Red is a concealer that does double duty. 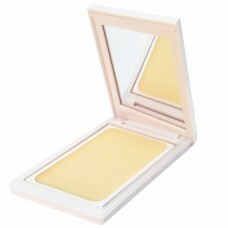 It conceals redness while it helps to reduce the discomfort of irritated skin. A rich array of ingredients comforts the skin. A gentle hint of yellow goes with all complexions and ... YES... it conceals the redness, completely. You'll be ahead with Instead of Red! Designed for rosaceans of all skin types, this Concealer offers the proven soothing power of Titanium Dioxide and Zinc Oxide. It is rich in such potent anti-oxidants as Green Tea Extract and Vitamin E, and with the boosting effect of Lilac Extract. This remarkable product moisturizes as it protects. It's an ideal camouflage that can also be used as a foundation for the entire face.